Offering meditation and yoga classes in the Park City and Salt Lake City areas. Haum Meditation offers meditation and yoga classes to the general public in our studio located in Park City. View our full class schedule or register online. If you're looking to offer your clients, employees, or private community members a mindfulness practice, we're here to help! Please feel free to contact us using the form below with any question or inquiry you have. We will get back to you as soon as we can. You can also touch base with us on social media. Follow @HaumMeditation on Facebook or Instagram. Thank you for reaching out. We will be in touch shortly. Have a wonderful day. 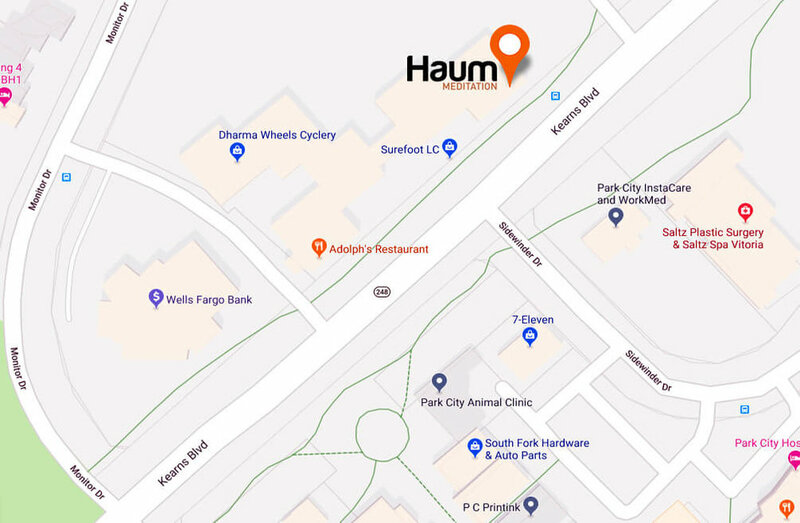 The Haum Meditation studio is located in the heart of Park City at 1500 Kearns Blvd in Suite AL-100. You'll find our studio on the main level of the building just behind the Park City local bus stop and just next door to the Parkside Apartments.